The 26.5 metre sailing yacht Jess Sea has changed central agencies and is now listed for sale by Bill Sanderson at Palm Beach Global Yachts. Built in aluminium by Merrifield-Roberts to a design by MacLear & Harris, Jess Sea was delivered in 2002 and is a yacht of enormous volume both inside and out. Accommodation is for six guests in three cabins comprising a full-beam master suite and two twins, all with entertainment centres, flatscreen televisions and en-suite marble shower facilities. Forward is a large cabin sleeping four crew aboard this yacht for sale. The full-beam saloon is expansive and has good ocean views through large ports that provide exceptional natural light and openness. To port is an ebony dining table seating seven guests, while to starboard is a seating area with leather upholstered chairs. The saloon also features striking hand-sealed dark teak flooring, granite-topped counters, a teak staved ceiling and an entertainment centre including a large flatscreen television. On deck, the cockpit easily seats ten guests for al fresco meals and has hosted cocktail parties for as many as 40 people under her current owners. 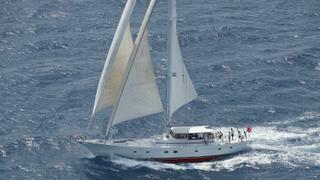 On the technical side, Jess Sea is cutter-rigged with an aluminium mast from Matrix Masts & Engineering in New Zealand. Under power, a 308hp Caterpillar diesel engine gives her a cruising speed of ten knots and a range of 2,500 nautical miles. Lying in Rhode Island, New York, Jess Sea is asking $1,295,000.